No 1 National Special Emulsion is superior quality paint. It is specially formulated. It has excellent application properties and a smooth pleasing finish. It can be applied on interior walls, ceiling, old new concrete plaster, chipboard and hard board. 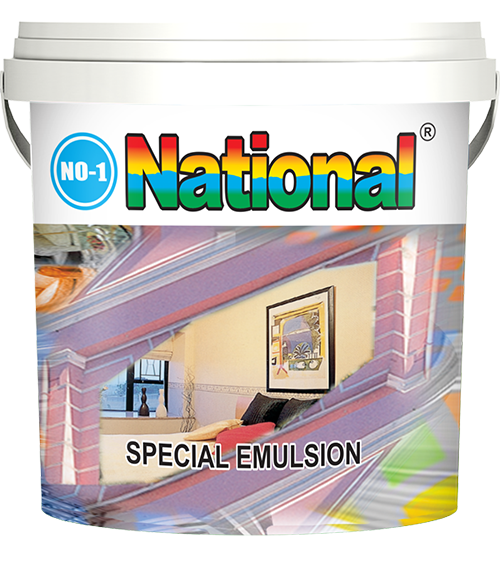 No 1 National Special Emulsion is used for all normal interior masonry surfaces including brickwork, plaster, cement and wallboard. New, bare, old or previously painted surfaces must be clean, dry and free from dust or wax. Clean the surface by rubbing down with abrasive paper. Brush down previously painted surface completely and make the surface smooth. For large holes and cracks, use plaster of Paris or white cement .Allow to dry. Apply No 1 National Wall Sealer in order to seal the surface from water and salts. Allow surface to dry completely. Then apply No 1 National Wall Filling and allow it to dry. Rub down the surface with abrasive paper and dust off. Now the surface will be smooth and ready for No 1 National Special Emulsion to be applied. Stir the paint thoroughly before use. Single pack, ready to use after 50% thinning with water. Brush, Roller or conventional spray.